Growth Mindset is an evidence-based approach to helping children be confident, capable learners. Growth Mindset theory describes a key positive mental attitude and approach to learning and development. A fixed mindset comes from a belief that intelligence and talent are fixed and that talent is more important than effort for achievement. Growth mindset research disputes and disproves this; it is the opposite of of a fixed mindset. A growth mindset is rooted in a belief that abilities can be developed through dedication and hard work. This positive mental attitude helps to foster both an interest in learning and a resilience against setbacks; both are essential for great achievement. Growth mindset research also highlights the high number of people with these qualities who have achieved a high level of success in life. Independent research into growth mindset by the Education Endowment Foundation show that the approach has a positive impact on teaching and learning, emphasising the crucial importance of implementation strategies - knowing about it is not enough. All of the SCARF lessons are written to support teachers in promoting this ethos. 2. 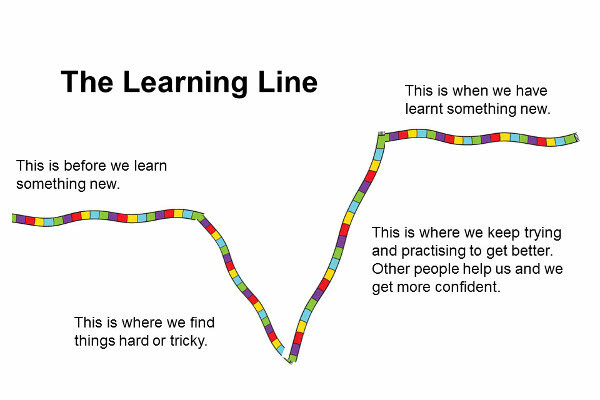 Many SCARF lesson plans explicitly promote a growth mindset through activities that help children to develop resilience and a positive attitude; these include Learning Lines (a visual tool to help children understand how we learn new skills). You can find these lessons by searching for Growth Mindset on the Subjects and Issues navigation tool.